The UN has warned that hundreds of thousands of civilians trapped in areas of heavy fighting in Sri Lanka's north are in serious danger. 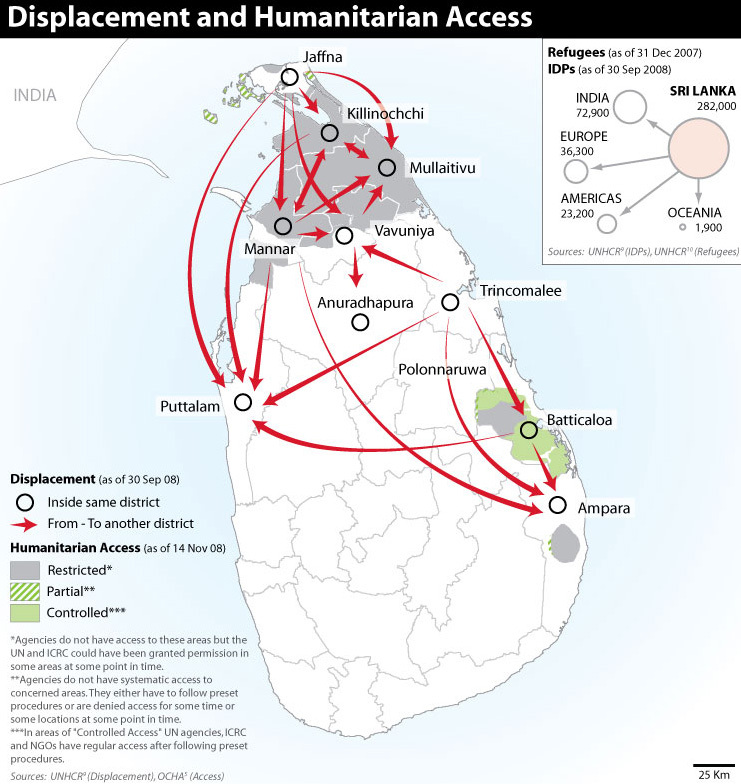 At least 230,000 internally displaced persons (IDPs) have retreated to a small patch of territory where government forces are engaged in heavy fighting with cadres from the Liberation Tigers of Tamil Eelam (LTTE) in the Mullaithivu and Kilinochchi Districts about 300km northeast of the capital, Colombo. "The situation of the civilians is increasingly untenable," Gordon Weiss, UN spokesman in Sri Lanka, told IRIN, "They are directly in the path of the fighting and we have many reports of clusters of civilians being killed and wounded by artillery fire." He told IRIN that UN staff trapped in bunkers on the northern A35 route had witnessed the killing and wounding of dozens of civilians over the past weekend as shells fell around them. Clashes are likely to intensify in the coming days with government forces gaining control of Mullaithivu, the last major town under LTTE control, on 25 January. "With the capture of the LTTE's main garrison town, Mullaithivu, yesterday [25 January], all seven offensive elements of the Sri Lanka Army are now sweeping up remaining LTTE pockets towards the north-eastern coast of the island," the Defence Ministry stated on 26 January. UN Secretary-General Ban Ki-moon raised concerns over the safety of civilians and urged they be given safe passage out of the conflict areas. "The Secretary-General also calls for all parties to allow and facilitate the movement of 250,000 civilians currently in the area of fighting to safe areas," according to a statement released by his office on 26 January. Several UN officials, including John Holmes, Under-Secretary-General for Humanitarian Affairs; Radhika Coomaraswamy, Special Representative of the Secretary-General for Children and Armed Conflict; and Philippe Duamelle, UN Children's Fund (UNICEF) Country Representative in Sri Lanka, urged the LTTE to allow civilians to move to safe areas and called for safeguarding of civilians. As fighting intensified, the government on 21 January announced it had declared a 35 sqkm safe zone for civilians. "The Secretary-General calls on both parties to respect 'no fire zones', 'safe areas', and civilian infrastructure, including schools, medical facilities and humanitarian facilities and assets," the Secretary-General's office said in the statement. "He is deeply concerned that the civilian population in the area is in increasingly dire need of humanitarian aid, including food, water, sanitation, and shelter." The UN had been transporting food supplies into the conflict areas since October after international agencies were directed to leave the areas amid deteriorating security. However, Weiss told IRIN the situation had now become too perilous and the best option was for civilians to move out to safe areas. "Civilians must be allowed to move to where they feel safe," he told IRIN. "Restrictions at this stage of the fighting are unacceptable and we call upon the LTTE to facilitate the movement of civilians out of the fire zone, and upon both parties to refrain from indiscriminate or unrestricted shelling." The UN is engaged in discussions with the LTTE to move out its local staff and dependents to safer areas. On 22 January, the UN Country Team in Sri Lanka released a statement criticising the LTTE for not allowing local staff and their dependents to move out safely. "We are in discussions with both the LTTE and the government to secure safe passage for local staff and dependents," Weiss said.